Each child's playhouse is individually handcrafted in Lancaster County, PA and built for us by our Amish friends referred to as "The Plain People" or Old Order Amish. 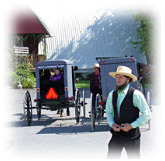 The Amish skills -- handed down from generation to generation -- result in unsurpassed quality. Great care is given to each and every detail. Our houses are so well built, that they often increase in value: a wonderful playhouse for your child - a great investment for you. Our sidewalls are 5' plus, and have a finished interior height of approximately 7'6," allowing an adult to stand up and walk around (this is several feet higher than most of the competition). Our playhouses are delivered fully built, and rest on 4"x4" joists that protect them from ground moisture. They are not kits and no assembly is required by the buyer. Our playhouse delivery company completes the final assembly of window boxes and chimney prior to departure from your site. They also can be easily relocated by the buyer at a later date without disassembly.